GCC: What to make with Sale Yarn! By far the most common sale question is: what can I make with this? 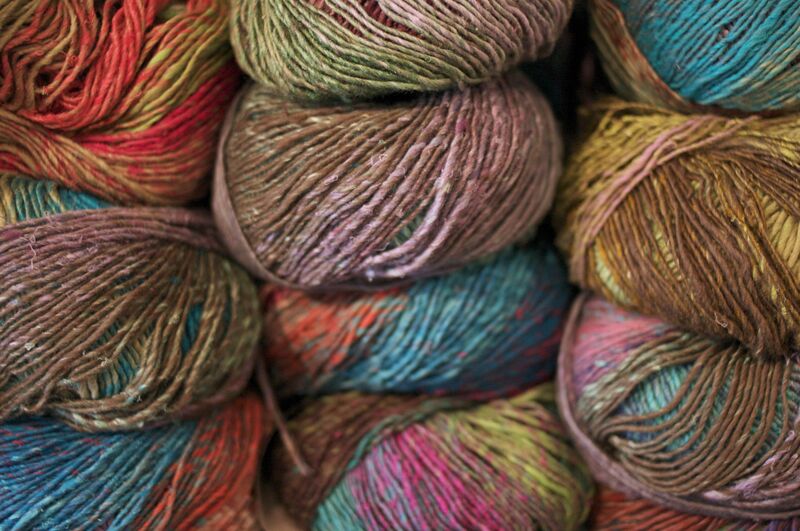 Everyone loves a deal and it’s nice to get yarn with a project or purpose in mind. I hate when I go to my stash and I have a few skeins but not enough to make what I want. So, that being said, here are a few sale tips. If you want to make a garment there are some basic guidelines for how much yarn to buy. Then get an extra ball or two. Sale items are final but it’s worth it. Seriously. There is absolutely nothing worse (in the world of knitting) than getting to the end of a large project and finding out you are a half a ball short. To figure out how much you will need, even if you don’t have a pattern yet you can either pick up a copy of The Knitter’s Handy Guide to Yarn Requirements and borrow a calculator, or just ask someone. We’ll be happy to do a little math for you! 1. Cashmerino Chunky: This is a 15 stitch gauge yarn that is super soft! This yarn is perfect for the Owls sweater. A popular pattern with the cutest cabled yoke. I also love any excuse to use that many buttons! You can get the pattern here and it takes 8-12 balls. The Shalom Cardigan is lovely for those Spring/Summer nights. It’s done top down, with quite enjoy. You can get the pattern here and it takes 6 balls. The pattern is written for sizes small and medium, otherwise you have to make your own alterations. For a smaller knit you can make Bella’s Mittens (3 balls) or my Antler Mittens (3 balls), or the Burberry Inspired Cowl (3 balls). 2. Cashmerino Aran. There are too many aran weight sweaters to count! The Central Park Hoodie is a lovely one, I love a little cable to spice things up. The pattern can be purchased from Interweave here and it takes 13-20 balls depending on the size. Cashmerino Aran is also perfect for a nice pair of Fetching fingerless gloves. One ball makes a pair so you can start on your Christmas gift knitting now! Or you can whip up a pair for convertable summer driving. 3. Donegal Tweed Chunky. You can knit up a charming little hat from Knitty called Shroom. The pattern can be found here and it takes 2 skeins. There are also lots of Debbie Bliss patterns for this yarn, just check out a couple of her books. These are just a few of the lovely yarns that are on sale and just a few of the patterns they go with. Come in and check it out! The sale is still going on! This entry was posted on Monday, May 17th, 2010 at 10:18 pm	and is filed under Uncategorized. You can follow any responses to this entry through the RSS 2.0 feed. Both comments and pings are currently closed.